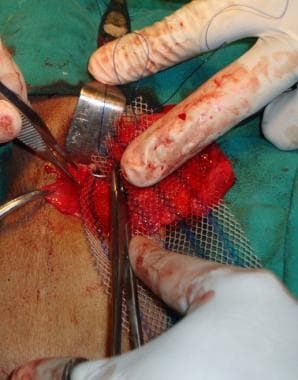 The ensuing discussion focuses primarily on the Lichtenstein tension-free mesh repair, which is an example of hernioplasty and is currently one of the most popular techniques of inguinal hernia repair. [6, 7] The Bassini, Shouldice, and darn repairs (all examples of herniorrhaphy) are also briefly discussed. The key technical point is that in the Lichtenstein tension-free repair, there is no attempt to repair the posterior wall, as is done in Bassini or Shouldice repairs; the weak posterior wall is reinforced with mesh. The incision is placed about 1 cm above and parallel to the inguinal ligament, beginning from the pubic tubercle and extending 5-6 cm laterally up to the midinguinal point (see the images below). The subcutaneous fat is then opened along the length of the incision, and careful hemostasis is achieved by ligating superficial pudendal and superficial epigastric vessels. Open inguinal hernia repair. Draping and incision. Open inguinal hernia repair. 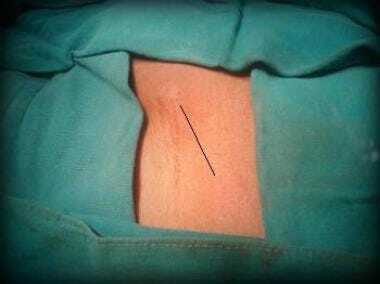 Skin incision. Open inguinal hernia repair. External oblique aponeurosis with external inguinal ring. The external oblique aponeurosis is then opened along the line of incision, starting from the external ring and extending laterally for up to 5 cm (see the image below). 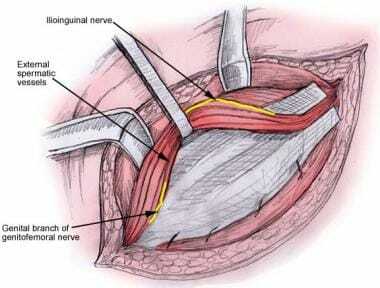 The ilioinguinal nerve, lying underneath the aponeurosis, is safeguarded during this procedure. Open inguinal hernia repair. Division of external oblique aponeurosis. The superior and inferior flaps of the external oblique aponeurosis are gently freed from the underlying contents of the inguinal canal and overturned and separated to expose the cremaster with the cord structures, the ilioinguinal and iliohypogastric nerves, the uppermost aponeurotic portion of the internal oblique muscle and conjoined tendon, and the free lower border of the inguinal ligament (see the images below). Wide separation of the two flaps provides ample space for placement and fixation of mesh under vision while protecting the nerves. Open inguinal hernia repair. 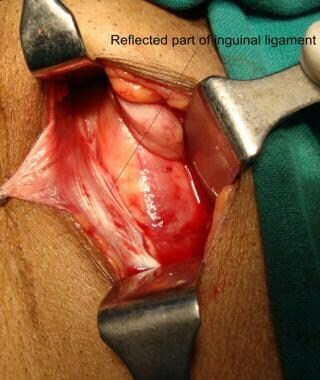 Reflected part of inguinal ligament exposed for fixing inferior edge of mesh. Open inguinal hernia repair. Inferior flap of external oblique aponeurosis developed to expose inguinal ligament from pubic tubercle to midinguinal point. Open inguinal hernia repair. Superior flap of external oblique aponeurosis is developed as high as possible to provide ample space for mesh placement. The spermatic cord, along with the cremaster, is then lifted up and separated from the pubic bone for about 2 cm beyond the pubic tubercle to create space for extending the mesh well beyond the pubic tubercle. Open inguinal hernia repair. Avascular plane between posterior inguinal wall and cord structures. Open inguinal hernia repair. Cord structures and hernia sac encircled by Penrose drain. Open inguinal hernia repair. Lifting up cord with hernia sac medial to external inguinal ring. Open inguinal hernia repair. 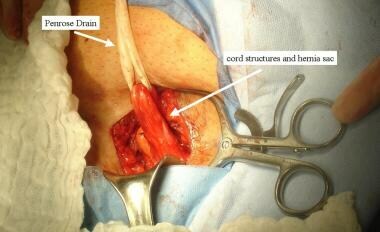 Cord structures and hernia sac looped along with ilioinguinal and genitofemoral nerves. The cord structures and all of the nerves of the inguinal canal having been visualized, the next step is to identify and isolate the hernia sac. The patient is asked to cough, and the groin region is examined for the presence of an indirect hernia, a direct hernia, a femoral hernia, a combined hernia, or a spigelian hernia. When the hernia sac is excised or divided, the proximal sac should never be left open; doing so may lead to recurrence. The proximal sac is dissected free of cord structures well above the internal ring, and a high ligation of the neck of the sac should be performed. 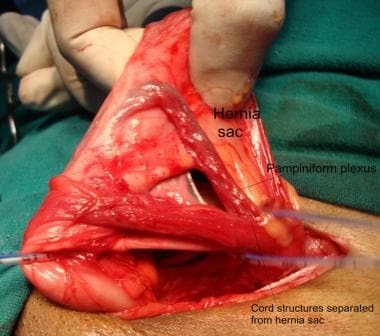 The indirect hernia sac lies anterolateral to the cord structures and is visualized by dividing the cremaster muscle longitudinally (see the image below). The cremaster muscle should not be divided transversely or excised, because doing so may result in low-lying testes and dysejaculation. Open inguinal hernia repair. Cremaster muscle picked up to be incised longitudinally between hemostats. Open inguinal hernia repair. 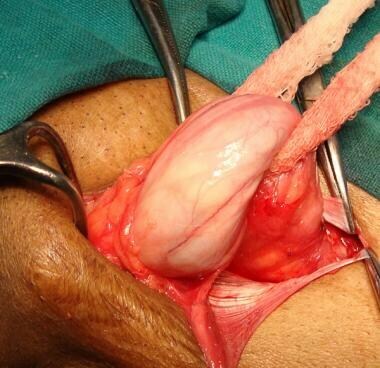 Hernia sac separated from cord structures. Open inguinal hernia repair. 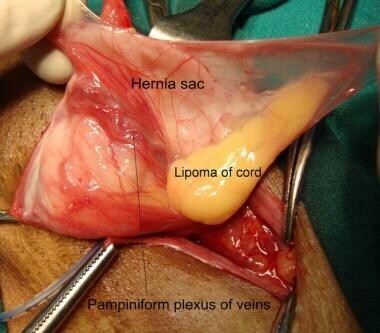 Indirect hernia sac dissected and being separated from lipoma of cord and cord structures. Open inguinal hernia repair. Lipoma of cord dissected free and excised. Open inguinal hernia repair. Indirect hernia sac separated from cord structures in midinguinal region toward neck of sac. Open inguinal hernia repair. Voluminous indirect hernia sac separated from cord structures in midinguinal region up to neck of sac. The neck of a large hernia sac is transected at the midpoint of the inguinal canal (see the first image below), and the proximal part is suture-ligated. A high ligation of the proximal sac is recommended, and the stump is reduced deep underneath the internal ring (see the second image below). The distal sac is left in place; however, the anterior wall of the distal sac is incised to prevent postoperative hydrocele formation (see the third image below). Open inguinal hernia repair. Hernia sac being divided near neck. Open inguinal hernia repair. 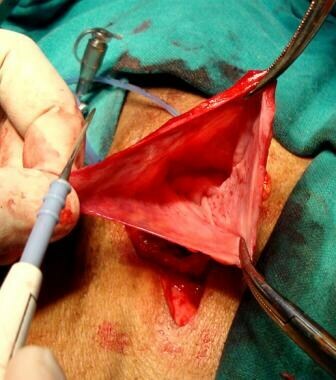 Contents of hernia sac reduced and proximal end to be sutured closed. Open inguinal hernia repair. Anterior wall of distal sac incised to prevent hydrocele formation. A direct inguinal hernia lies posteromedial to the cord structures. The direct hernia sac is isolated and dissected free. Its contents are reduced, and the peritoneal sac is inverted and maintained in position with a purse-string suture. If a femoral hernia is suspected, the femoral ring should be evaluated by incising the medial part of the iliopubic tract. If a sac is seen entering the femoral ring, it is reduced and dealt with by inverting or ligating the neck of the sac. A spigelian hernia is managed in a similar manner. A sliding hernia is simply dissected free and inverted in the preperitoneal space. A 7.5 × 15 cm piece of polypropylene mesh is commonly used for a Lichtenstein hernioplasty. On the medial side, the sharp corners of the mesh are trimmed to conform to the patient’s anatomy. For a femoral hernia, the mesh is tailored so that it has a triangular extension from its lower edge on its medial side. To compensate for future shrinkage, the mesh should be wide enough to extend 3-4 cm beyond the boundary of the inguinal triangle. To compensate for increased intra-abdominal pressure when the patient stands up, the mesh should be placed lax in the posterior wall of the inguinal canal in such a way that it acquires a domelike wrinkle. 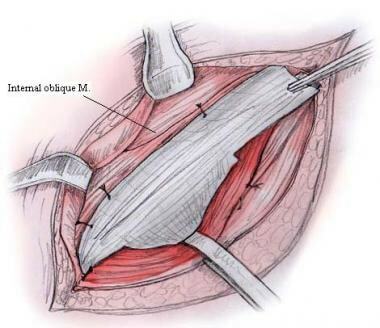 The first medialmost stitch fixes the mesh 2 cm medial to the pubic tubercle, where the anterior rectus sheath inserts into the pubic bone (see the image below). Care should be taken not to pass the needle through the periosteum of the bone or through the pubic tubercle; this is one of the most common causes of chronic postoperative pain. Open inguinal hernia repair. First medialmost stitch in mesh, fixed about 2 cm medial to pubic tubercle, where anterior rectus sheath inserts into pubis. The same suture is then used as a continuous suture to fix the lower edge of the mesh to the free lower border of inguinal ligament up to a point just lateral to the internal ring (see the images below). No more than four or five passes are required. 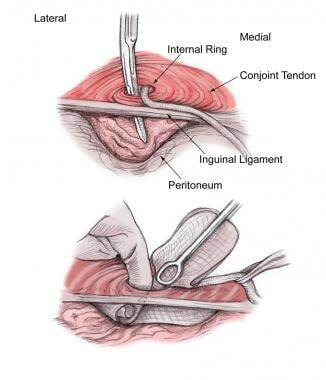 Open inguinal hernia repair. Same suture is utilized as continuous suture to fix lower edge of mesh to reflected part of inguinal ligament up to internal ring. Open inguinal hernia repair. Fixation of lower edge of mesh. For a femoral hernia, the medial portion of the iliopubic tract is excised, and the Cooper ligament is exposed. The lower triangular extension on the medial side of the mesh is stitched to the Cooper ligament, and the suture is continued to fix the lower edge of the mesh to the inguinal ligament, as above. Next, a slit is made in the lateral end of the mesh to create a narrower lower tail (the lower one third) and a wider upper tail (the upper two thirds). The slit extends up to a point just medial to the internal inguinal ring (see the image below). Open inguinal hernia repair. Lower edge of mesh sutured to inguinal ligament up to internal inguinal ring. To accommodate cord structures, lateral end of mesh is divided into wider upper (two thirds) tail and narrower lower (one third) tail. The upper tail is then passed underneath the cord in such a way as to position the mesh posterior to the cord in the inguinal canal (see the image below), and the spermatic cord is placed between the two tails of the mesh. The upper tail is then crossed over the lower one, and the two tails are held in an artery forceps. Open inguinal hernia repair. Wider upper tail of mesh is passed underneath cord, and mesh is placed posteriorly in inguinal canal behind spermatic cord. With the mesh kept lax, its upper edge is then fixed to the rectus sheath and the internal oblique aponeurosis with two or three interrupted nonabsorbable sutures (see the first image below). On occasion, the iliohypogastric nerve is found to be in the way of upper edge of the mesh. In such cases, the mesh may be split to accommodate the nerve (see the second image below). Open inguinal hernia repair. Fixation of upper edge of mesh. Open inguinal hernia repair. Slit made in mesh to accommodate iliohypogastric nerve. 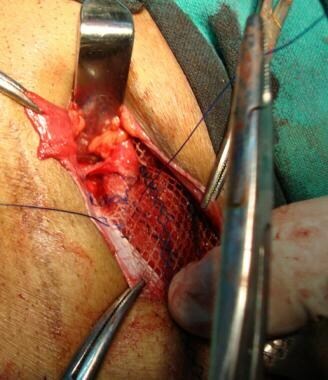 Two interrupted sutures are taken under vision to fix upper edge of mesh while safeguarding iliohypogastric nerve. 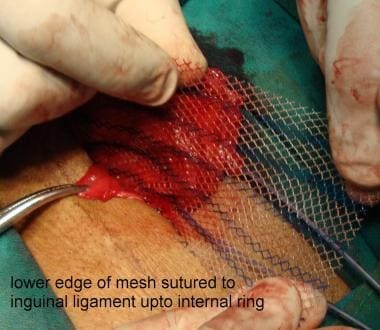 The two tails are then tucked together and fixed to the inguinal ligament just lateral to the internal ring, thus creating a new internal ring made of mesh (see the first image below). The tails are trimmed 5 cm beyond the internal ring and placed underneath the external oblique aponeurosis (see the second image below). Open inguinal hernia repair. Upper tail is crossed over lower tail around spermatic cord, thus creating internal ring. Lower edges of two tails are tucked together to inguinal ligament just lateral to internal ring. Open inguinal hernia repair. Tails are then passed underneath external oblique aponeurosis to give overlap of about 5 cm beyond internal ring. If any of the nerves is injured or of doubtful integrity, it can be resected and its proximal end ligated and buried within the fibers of the internal oblique muscle to keep the stump of the nerve away from scarring. In male patients, the testes should always be gently pulled back down to their normal scrotal position after fixation of the mesh. Spermatic cord layers are closed with fine sutures, with care taken to avoid damaging the cord contents. 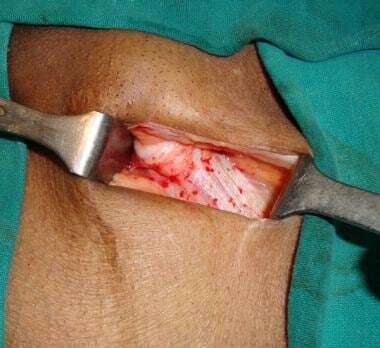 Hemostasis is ensured in the inguinal canal, which is then closed by suturing the two flaps of the external oblique aponeurosis (see the images below), with care taken not to injure the underlying ilioinguinal nerve. 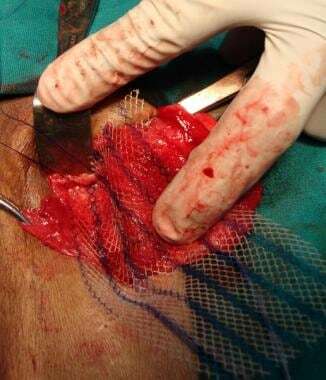 Suturing is started laterally and continued medially, where an adequate opening is left at the newly created superficial inguinal ring so as not to occlude the emerging spermatic cord. Open inguinal hernia repair. External oblique aponeurosis sutured with 2-0 polypropylene. Open inguinal hernia repair. 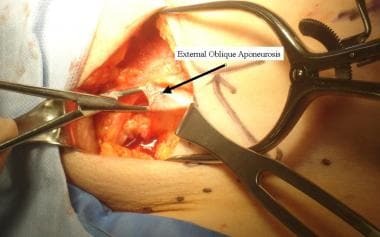 Closure of external oblique aponeurosis. Subcutaneous tissue is approximated with interrupted sutures to obliterate any dead space, and the skin is approximated with sutures, clips, or adhesive strips (see the images below). A subcuticular continuous stitch with 3-0 absorbable sutures obviates any need for stitch or clip removal and provides better cosmetic results. Open inguinal hernia repair. Subcutaneous tissue approximated with 3-0 plain catgut. Open inguinal hernia repair. Skin approximated with 2-0 polypropylene subcuticular suture. Open inguinal hernia repair. Skin closure. The operative site is cleaned and a sterile dressing applied. Local infiltration of a long-acting anesthetic agent (eg, bupivacaine or ropivacaine) into the subcutaneous tissue around the incision provides good immediate postoperative pain relief. The plug-and-patch repair adds a polypropylene plug shaped as a cone, which can be deployed into the internal ring after reduction of an indirect sac. The plug then acts as a toggle bolt to reinforce the defect. The Prolene Hernia System (PHS) consists of an anterior oval polypropylene mesh connected to a posterior circular component. The posterior component is deployed in a bluntly created preperitoneal space (see the first image below). The anterior portion is then laid out with a cut made to recreate the internal ring (see the second image below). 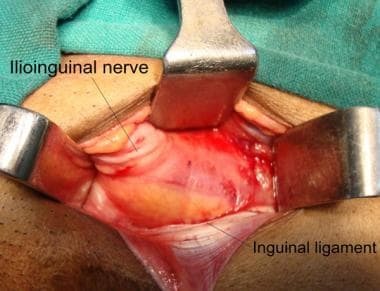 The anterior portion is then sutured above to the conjoined tendon and below to the shelving edge of the inguinal ligament and is tucked behind the external oblique aponeurosis (see the third image below). Open inguinal hernia repair. Development of preperitoneal space. Open inguinal hernia repair. Deployment of Prolene Hernia System (PHS). Open inguinal hernia repair. 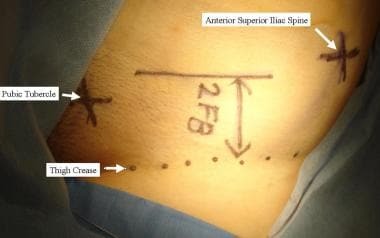 Final position of Prolene Hernia System (PHS) mesh. 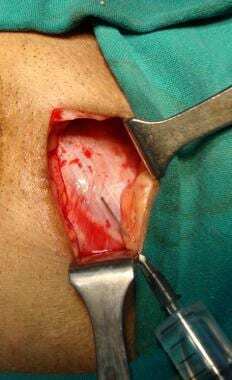 In the McVay repair, the conjoined (transversus abdominis and internal oblique) tendon is sutured to the Cooper ligament with interrupted nonabsorbable sutures. 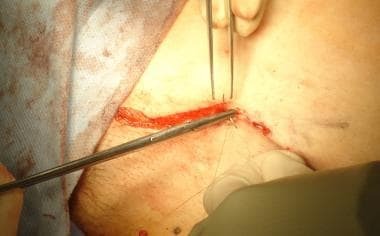 The Bassini technique for inguinal hernia repair involves suturing the transversalis fascia and the conjoined tendon to the inguinal ligament behind the spermatic cord with monofilament nonabsorbable suture. It also involves the so-called Tanner slide, which is a vertical relaxing incision in the anterior rectus sheath intended to prevent tension. 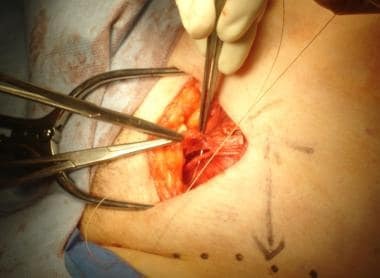 The Shouldice technique is a four-layer inguinal hernia repair performed with the patient under local anesthesia. The transversalis fascia is incised from the internal ring laterally to the pubic tubercle medially, and upper and lower flaps are created. These flaps are then overlapped (double-breasted) with two layers of sutures. 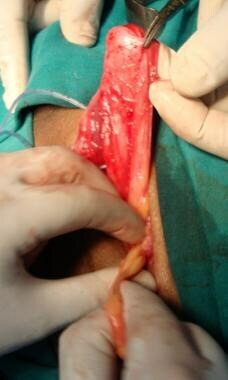 The conjoined tendon is then sutured to the inguinal ligament, again in two overlapping layers. This reinforces the posterior wall and narrows the deep inguinal ring. The Shouldice repair is classically done with a continuous suture of 32- to 34-gauge stainless steel wire, but synthetic monofilaments (eg, polypropylene) can also be used. The external oblique aponeurosis is then closed in a double-breasted fashion in front of the spermatic cord. 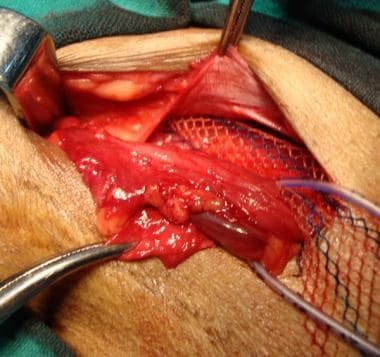 A darn inguinal hernia repair is a pure-tissue tensionless technique that is performed by placing a continuous suture between the conjoined tendon and the inguinal ligament without approximating the two structures. After the procedure, the patient is asked to rest for few hours. He or she may be discharged later the same day on a day-care basis. Early mobilization is the key to rapid convalescence. Patients can safely ambulate on the evening of the operation. If general or regional anesthesia is used, the patient may be hospitalized for a few days. There is some pain in the postoperative period, and suitable analgesics should be prescribed. The dressing is removed on postoperative day 5, and stitches are removed on postoperative day 7. Patients should be advised to avoid strenuous activities for a few weeks. Typically, light work can be resumed after 1 week, heavier jobs after 6 weeks. Male patients should be monitored for testicular atrophy, which may occur as a result of venous or arterial injury or obstruction in the spermatic cord. All patients should be monitored for the development of nerve pain from nerve entrapment in suture material. Finally, patients should be monitored for recurrence, which may arise as a consequence of inadequate repair, wound infection, or chronic straining (eg, from coughing, constipation, or urination). In systematic reviews, the overall risk of complications after inguinal hernia surgery has been in the range of 15-28%. Complications may develop intraoperatively or postoperatively. Early postoperative complications include seroma formation and hematoma (8-22% of cases), urinary retention, and wound infection (1-7% of cases). Late postoperative complications include sensory loss, hyperesthesia, chronic inguinal pain, mesh-related problems, hydrocele, testicular pain, testicular swelling, atrophy, and recurrence of hernia. Intraoperative complications of open inguinal hernia repair include vascular injuries, injuries to abdominopelvic structures, and nerve injuries. Superficial epigastric vessels in the incision may bleed. These vessels not only should be identified when the incision is being made but also should be ligated and divided. Inferior epigastric vessels may be injured during dissection of the spermatic cord in the inguinal canal, dissection of an indirect inguinal hernia sac within the spermatic cord, plication of the transversalis fascia, or transfixion of the hernial sac. These vessels should be identified at an early stage and protected. External iliac or femoral vessels, especially veins, may be injured during fixation of the mesh to the inguinal ligament in its lateral part. The tissue bites in the inguinal ligament should not be very deep. Although less common than other intraoperative complications, vascular injuries are potentially disastrous. They can be avoided by respecting the proximity of the femoral vessels, particularly when suturing the mesh to the inguinal ligament. Hematoma formation can result from injury of the inferior epigastric vessels or pampiniform plexus veins or from failure to ligate the superficial subcutaneous veins. 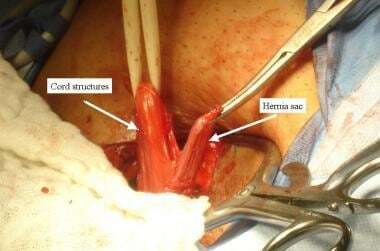 Cord structures (eg, testicular artery, pampiniform plexus of veins, and vas deferens) may be injured during opening of the coverings of the spermatic cord or dissection of the indirect hernial sac within the spermatic cord. 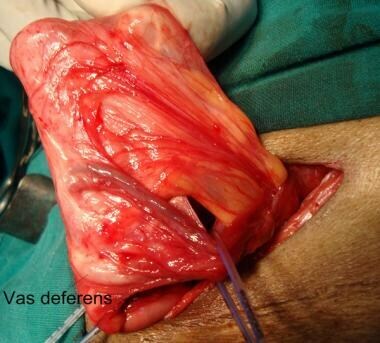 In particular, the surgeon should always be aware of the vas deferens and should protect it from injury. Injury to the urinary bladder may occur during plication of the transversalis fascia. In addition, injury to the urinary bladder, cecum, or sigmoid colon may occur during transfixion of the hernial sac in a sliding indirect inguinal hernia (where these viscera are not contained in the hernial sac but form a part of the wall of the sac). A sliding hernia should be recognized early; if it is present, the entire hernial sac should not be excised. Injury to the bowel may occur during transfixion of the neck of an indirect hernial sac. The head end of the operating table can be lowered to ensure complete reduction of contents of the sac, the sac can be twisted to push the contents into the peritoneal cavity, and a tissue bite can be taken and the suture tied under vision. 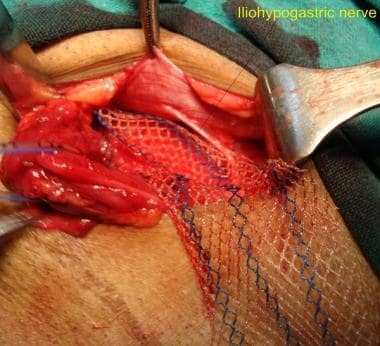 The iliohypogastric nerve, because it lies on the conjoined tendon outside the inguinal canal, may be injured during dissection of the upper flap of the external oblique aponeurosis or fixation of the mesh to the conjoined tendon. 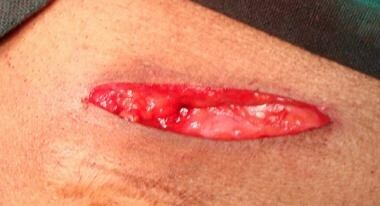 It may also become trapped in sutures during closure of the external oblique aponeurosis. The ilioinguinal nerve, because it lies in the inguinal canal along with the spermatic cord, may be injured during dissection of the cord. The genital branch of the genitofemoral nerve, because it lies within the spermatic cord, may be injured during dissection of the hernia sac. Urinary retention may occur after open inguinal hernia repair, especially in middle-aged and elderly male patients with prostatic enlargement. In a meta-analysis of 72 studies, the incidence of urinary retention after herniorrhaphy was 0.37% (33 of 8991 patients) with local anesthesia, 2.42% (150 of 6191 patients) with regional anesthesia, and 3% (344 of 11,471 patients) with general anesthesia. Such retention is said to be due to the inhibitory effect of regional and general anesthesia on bladder function. Most seromas disappear spontaneously within 6-8 weeks. If a seroma persists, it may be aspirated. A small hematoma may be treated conservatively. For larger hematomas, which are asymptomatic, evacuation under anesthesia should be considered. 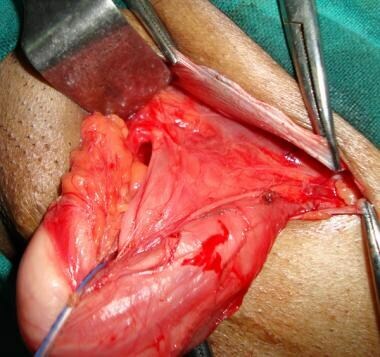 Meticulous dissection with adequate hemostasis will reduce the incidence of seroma and hematoma formation. Deep and persistent infection may necessitate removal of the mesh. Wound infection can also weaken the repair and may be responsible for recurrence of the hernia. Postoperative chronic pain is more frequent than was previously understood and has become one of the most important primary endpoints in hernia surgery. In published reports, the incidence of postherniorrhaphy pain has ranged from 0% to more than 30%. Chronic inguinodynia is defined as pain persisting more than 3 months post herniorrhaphy, after the process of wound healing is complete. Nonfixation or inadequate mesh fixation results in folding and rolling of the mesh, which can cause chronic pain and recurrence of the hernia. Chronic pain after mesh hernioplasty also results from neuroma formation after accidental division of the nerves. The ilioinguinal, iliohypogastric, and genitofemoral nerves are visualized and protected throughout the operation. They should not be dissected free from their natural bed; doing so can lead to perineural fibrosis and chronic pain postoperatively. Deliberate sectioning of the nerves intraoperatively to prevent chronic groin pain has been described but is still controversial. Current recommendations consist of nerve identification, minimal handling, and preservation. Prevention of nerve injury is very important because treatment of chronic neuralgias may not be successful. Another cause of significant postherniorrhaphy pain is the placement of a stitch into the periosteum at the pubic tubercle for fixation of the mesh medially. This is often the point of maximal tenderness postoperatively. Therefore, one should avoid taking a deep bite through the periosteum of the pubic tubercle; tough, fibrous tissue in that region should instead be used for fixing the mesh. Scrotal edema or hydrocele due to venous and lymphatic damage during dissection within the spermatic cord may also occur. Ischemic orchitis leading to testicular atrophy is a rare but well-known complication of inguinal hernia surgery. The patient may complain of pain and testicular swelling postoperatively. Symptoms may last for 2-3 months, and testicular atrophy may occur. The rarity of this complication notwithstanding, the surgeon should maintain a high index of suspicion. Testicular ultrasonography and Doppler studies may facilitate early diagnosis and help avoid orchiectomy. 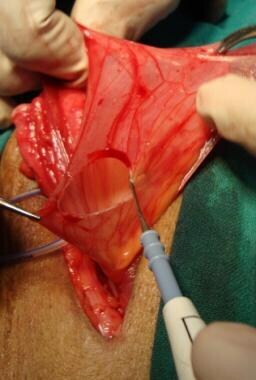 Ischemic orchitis is thought to be secondary to venous thrombosis rather than arterial injury. 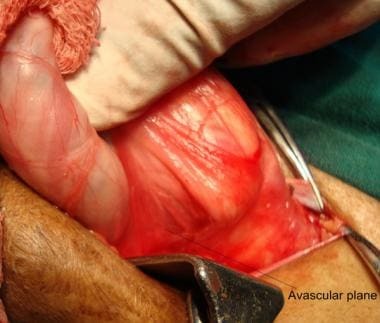 Thrombosis is caused by surgical trauma to the delicate veins of the pampiniform plexus and disruption of the collateral blood supply to the testes during an attempt at complete removal of a large hernia sac. It is also more likely in operations for recurrent hernia. It is thus advisable not to attempt complete dissection and excision of a large hernia sac. The neck of the hernia sac is transected at the midpoint of the inguinal canal, and the distal sac is left in place. However, the anterior wall of the distal sac is incised to prevent postoperative hydrocele. The recurrence rate for Lichtenstein hernioplasty at specialist clinics in the United States is consistently less than 1%. In an audit of Lichtenstein hernioplasty performed with local anesthesia by surgical residents, the recurrence rate was 2.1% over a 10-year follow-up period. Recurrence in Lichtenstein hernioplasty may be due to inaccurate execution of the technique (inadequate size or improper fixation of the mesh) or to an overlooked hernia at the primary operation. To avoid the latter, the patient should be asked to cough, and the region should be carefully examined for an indirect hernia, a direct hernia, a femoral hernia, or a combined hernia. Recurrence may be more frequent in the presence of comorbid conditions (eg, chronic obstructive pulmonary disease) or obesity or with the use of steroids. Other contributing factors may be the use of too-small pieces of mesh placed flat under tension, failure to achieve adequate overlap (medially, 2 cm beyond the pubic tubercle; laterally, 5-6 cm beyond the internal ring), or failure to cross the tails of the mesh. A thorough clinical evaluation, a high degree of suspicion, and diligent follow-up are advised to keep track of recurrences. Awad SS, Fagan SP. Current approaches to inguinal hernia repair. Am J Surg. 2004 Dec. 188(6A Suppl):9S-16S. [Medline]. Scott NW, McCormack K, Graham P, Go PM, Ross SJ, Grant AM. Open mesh versus non-mesh for repair of femoral and inguinal hernia. Cochrane Database Syst Rev. 2002. CD002197. [Medline]. Hosgor M, Karaca I, Ozer E, Suzek D, Ulukus C, Ozdamar A. Do alterations in collagen synthesis play an etiologic role in childhood inguinoscrotal pathologies: an immunohistochemical study. J Pediatr Surg. 2004 Jul. 39(7):1024-9. [Medline]. Junge K, Klinge U, Prescher A, Giboni P, Niewiera M, Schumpelick V. Elasticity of the anterior abdominal wall and impact for reparation of incisional hernias using mesh implants. Hernia. 2001 Sep. 5(3):113-8. [Medline]. [Guideline] Simons MP, Aufenacker T, Bay-Nielsen M, Bouillot JL, Campanelli G, Conze J, et al. European Hernia Society guidelines on the treatment of inguinal hernia in adult patients. Hernia. 2009 Aug. 13(4):343-403. [Medline]. [Full Text]. O'Dwyer PJ, Norrie J, Alani A, Walker A, Duffy F, Horgan P. Observation or operation for patients with an asymptomatic inguinal hernia: a randomized clinical trial. Ann Surg. 2006 Aug. 244(2):167-73. [Medline]. Fitzgibbons RJ Jr, Giobbie-Hurder A, Gibbs JO, et al. Watchful waiting vs repair of inguinal hernia in minimally symptomatic men: a randomized clinical trial. JAMA. 2006 Jan 18. 295(3):285-92. [Medline]. Grosz CR. Iliohypogastric nerve injury. Am J Surg. 1981 Nov. 142(5):628. [Medline]. Fingerhut A, Millet B, Veyrie N, et al. Inguinal hernia repair, update 2006. Edmund AM, Neugebauer S, Fingerhut A, et al. EAES Guidelines for Endoscopic Surgery. Springer; 2006. 1: 294-307. Pisanu A, Podda M, Saba A, Porceddu G, Uccheddu A. Meta-analysis and review of prospective randomized trials comparing laparoscopic and Lichtenstein techniques in recurrent inguinal hernia repair. Hernia. 2015 Jun. 19 (3):355-66. [Medline]. Chung L, O'Dwyer PJ. Treatment of asymptomatic inguinal hernias. Surgeon. 2007 Apr. 5(2):95-100; quiz 100, 121. [Medline]. Chung L, Norrie J, O'Dwyer PJ. Long-term follow-up of patients with a painless inguinal hernia from a randomized clinical trial. Br J Surg. 2011 Apr. 98 (4):596-9. [Medline]. Koch A, Edwards A, Haapaniemi S, Nordin P, Kald A. Prospective evaluation of 6895 groin hernia repairs in women. Br J Surg. 2005 Dec. 92(12):1553-8. [Medline]. Woods B, Neumayer L. Open repair of inguinal hernia: an evidence-based review. Surg Clin North Am. 2008 Feb. 88(1):139-55, ix-x. [Medline]. Lichtenstein IL, Shulman AG, Amid PK, Montllor MM. The tension-free hernioplasty. Am J Surg. 1989 Feb. 157(2):188-93. [Medline]. Malangoni MA, Rosen MJ. Hernias. Townsend CM Jr, Beauchamp RD, Evers BM, Mattox KL, eds. Sabiston Textbook of Surgery: The Biological Basis of Modern Surgical Practice. 20th ed. Philadelphia: Elsevier; 2017. 1092-119. Starling JR, Harms BA. Diagnosis and treatment of genitofemoral and ilioinguinal neuralgia. World J Surg. 1989 Sep-Oct. 13(5):586-91. [Medline]. Wijsmuller AR, Lange JF, Kleinrensink GJ, et al. Nerve-identifying inguinal hernia repair: a surgical anatomical study. World J Surg. 2007 Feb. 31(2):414-20; discussion 421-2. [Medline]. Paajanen H, Varjo R. Ten-year audit of Lichtenstein hernioplasty under local anaesthesia performed by surgical residents. BMC Surg. 2010 Aug 4. 10:24. [Medline]. [Full Text]. Wiese M, Kaufmann T, Metzger J, et al. Learning curve for Lichtenstein hernioplasty. Open Access Surg. 2010 Jul 2. 3:43-6. [Full Text]. Kark AE, Kurzer M, Waters KJ. Tension-free mesh hernia repair: review of 1098 cases using local anaesthesia in a day unit. Ann R Coll Surg Engl. 1995 Jul. 77(4):299-304. [Medline]. [Full Text]. Gianetta E, Cuneo S, Vitale B, Camerini G, Marini P, Stella M. Anterior tension-free repair of recurrent inguinal hernia under local anesthesia: a 7-year experience in a teaching hospital. Ann Surg. 2000 Jan. 231(1):132-6. [Medline]. [Full Text]. Zhao G, Gao P, Ma B, Tian J, Yang K. Open mesh techniques for inguinal hernia repair: a meta-analysis of randomized controlled trials. Ann Surg. 2009 Jul. 250(1):35-42. [Medline]. Chung RS, Rowland DY. Meta-analyses of randomized controlled trials of laparoscopic vs conventional inguinal hernia repairs. Surg Endosc. 1999 Jul. 13 (7):689-94. [Medline]. Espat NJ. Biomaterials in hernia repair. Fischer JE, Jones DB, Pomposelli FB, et al, eds. Fischer's Mastery of Surgery. 6th ed. Philadelphia: Wolters Kluwer; 2012. Chap 209. Bringman S, Wollert S, Osterberg J, Smedberg S, Granlund H, Heikkinen TJ. Three-year results of a randomized clinical trial of lightweight or standard polypropylene mesh in Lichtenstein repair of primary inguinal hernia. Br J Surg. 2006 Sep. 93(9):1056-9. [Medline]. Weyhe D, Belyaev O, Müller C, Meurer K, Bauer KH, Papapostolou G, et al. Improving outcomes in hernia repair by the use of light meshes--a comparison of different implant constructions based on a critical appraisal of the literature. World J Surg. 2007 Jan. 31(1):234-44. [Medline]. Lichtenstein IL, Shulman AG, Amid PK, Montllor MM. Cause and prevention of postherniorrhaphy neuralgia: a proposed protocol for treatment. Am J Surg. 1988 Jun. 155(6):786-90. [Medline]. Wantz GE. Complications of inguinal hernial repair. Surg Clin North Am. 1984 Apr. 64(2):287-98. [Medline]. Franklin ME Jr, Gonzalez JJ Jr, Glass JL. Use of porcine small intestinal submucosa as a prosthetic device for laparoscopic repair of hernias in contaminated fields: 2-year follow-up. Hernia. 2004 Aug. 8(3):186-9. [Medline]. Ferzli GS, Edwards E, Al-Khoury G, Hardin R. Postherniorrhaphy groin pain and how to avoid it. Surg Clin North Am. 2008 Feb. 88(1):203-16, x-xi. [Medline]. Delikoukos S, Fafoulakis F, Christodoulidis G, Theodoropoulos T, Hatzitheofilou C. Re-operation due to severe late-onset persisting groin pain following anterior inguinal hernia repair with mesh. Hernia. 2008 Dec. 12(6):593-5. [Medline]. Shamberger RC, Ottinger LW, Malt RA. Arterial injuries during inguinal herniorrhaphy. Ann Surg. 1984 Jul. 200(1):83-5. [Medline]. Sanchez-Manuel FJ, Lozano-García J, Seco-Gil JL. Antibiotic prophylaxis for hernia repair. Cochrane Database Syst Rev. 2007 Jul 18. CD003769. [Medline]. Shankar VG, Srinivasan K, Sistla SC, Jagdish S. Prophylactic antibiotics in open mesh repair of inguinal hernia - a randomized controlled trial. Int J Surg. 2010. 8(6):444-7. [Medline]. Franneby U, Sandblom G, Nordin P, Nyren O, Gunnarsson U. Risk factors for long-term pain after hernia surgery. Ann Surg. 2006 Aug. 244(2):212-9. [Medline]. Albo D, Awad SS, Berger DH, Bellows CF. Decellularized human cadaveric dermis provides a safe alternative for primary inguinal hernia repair in contaminated surgical fields. Am J Surg. 2006 Nov. 192(5):e12-7. [Medline]. O'Dwyer PJ, Alani A, McConnachie A. Groin hernia repair: postherniorrhaphy pain. World J Surg. 2005 Aug. 29(8):1062-5. [Medline]. Hair A, Duffy K, McLean J, et al. Groin hernia repair in Scotland. Br J Surg. 2000 Dec. 87(12):1722-6. [Medline]. Nilsson H, Stylianidis G, Haapamaki M, Nilsson E, Nordin P. Mortality after groin hernia surgery. Ann Surg. 2007 Apr. 245(4):656-60. [Medline]. Taylor EW, Duffy K, Lee K, et al. 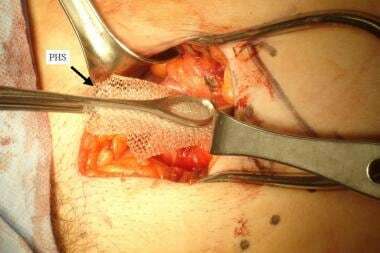 Surgical site infection after groin hernia repair. Br J Surg. 2004 Jan. 91(1):105-11. [Medline]. Earle DB, Mark LA. Prosthetic material in inguinal hernia repair: how do I choose?. Surg Clin North Am. 2008 Feb. 88(1):179-201, x. [Medline]. Amid PK. How to avoid recurrence in Lichtenstein tension-free hernioplasty. Am J Surg. 2002 Sep. 184(3):259-60. [Medline]. Sanders DL, Waydia S. A systematic review of randomised control trials assessing mesh fixation in open inguinal hernia repair. Hernia. 2014 Apr. 18 (2):165-76. [Medline]. Akyol C, Kocaay F, Orozakunov E, Genc V, Kepenekci Bayram I, Cakmak A, et al. Outcome of the patients with chronic mesh infection following open inguinal hernia repair. J Korean Surg Soc. 2013 May. 84(5):287-91. [Medline]. [Full Text]. van Veen RN, Mahabier C, Dawson I, et al. Spinal or local anesthesia in lichtenstein hernia repair: a randomized controlled trial. Ann Surg. 2008 Mar. 247(3):428-33. [Medline]. Nordin P, Zetterstrom H, Gunnarsson U, Nilsson E. Local, regional, or general anaesthesia in groin hernia repair: multicentre randomised trial. Lancet. 2003 Sep 13. 362(9387):853-8. [Medline]. Nordin P, Haapaniemi S, van der Linden W, Nilsson E. Choice of anesthesia and risk of reoperation for recurrence in groin hernia repair. Ann Surg. 2004 Jul. 240(1):187-92. [Medline]. Amid PK, Shulman AG, Lichtenstein IL. Local anesthesia for inguinal hernia repair step-by-step procedure. Ann Surg. 1994 Dec. 220(6):735-7. [Medline]. Wagner JP, Brunicardi FC, Amid PK, Chen DC. Inguinal hernias. Brunicardi FC, Andersen DK, Billiar TR, et al, eds. Schwartz's Principles of Surgery. 10th ed. New York: McGraw-Hill; 2015. Chap 37. Sanabria A, Dominguez LC, Valdivieso E, Gomez G. Prophylactic antibiotics for mesh inguinal hernioplasty: a meta-analysis. Ann Surg. 2007 Mar. 245(3):392-6. [Medline]. Terzi C. Antimicrobial prophylaxis in clean surgery with special focus on inguinal hernia repair with mesh. J Hosp Infect. 2006 Apr. 62(4):427-36. [Medline]. Bay-Nielsen M, Thomsen H, Andersen FH, et al. Convalescence after inguinal herniorrhaphy. Br J Surg. 2004 Mar. 91(3):362-7. [Medline]. Amid PK, Chen DC. Lichtenstein tension-free hernioplasty. Fischer JE, Jones DB, Pomposelli FB et al, eds. Fischer's Mastery of Surgery. 6th ed. Philadelphia: Wolters Kluwer; 2012. Chap 205. Stylianidis G, Haapamäki MM, Sund M, Nilsson E, Nordin P. Management of the hernial sac in inguinal hernia repair. Br J Surg. 2010 Mar. 97(3):415-9. [Medline]. Franklin ME Jr, Gonzalez JJ Jr, Michaelson RP, Glass JL, Chock DA. Preliminary experience with new bioactive prosthetic material for repair of hernias in infected fields. Hernia. 2002 Dec. 6(4):171-4. [Medline]. Hakeem A, Shanmugam V. Inguinodynia following Lichtenstein tension-free hernia repair: a review. World J Gastroenterol. 2011 Apr 14. 17(14):1791-6. [Medline]. [Full Text]. Chastan P. Tension-free open hernia repair using an innovative self-gripping semi-resorbable mesh. Hernia. 2009 Apr. 13(2):137-42. [Medline]. Anatomy of nerves of groin. Hesselbach triangle. Image courtesy of Wikimedia Commons. The authors and editors of Medscape Reference thank Karen Medin for her illustrations. Dr Saxena gratefully acknowledges the contributions of Dr Deepak Krishna, Resident Surgical Officer, and Dr Dinesh Khatri, Resident Surgical Officer, Department of Surgery, Gandhi Medical College and Hamidia Hospital, to the development and writing of this article. Dr Kapoor would like to express his gratitude to his teachers and trainers, (the late) Prof Atm Prakash and Prof L K Sharma, who taught him the techniques and principles of hernia repair when he was a surgical trainee at the All India Institute of Medical Sciences, New Delhi, India, in the early 1980s.